Hugh Fearnley-Whittingstall’s River Cottage Every Day Veg, has provided the Gas Mark 5 kitchen with an abundance of tasty veggy dinners and this one for peppers with new potatoes, pesto and feta is no exception. It’s pretty simple to make and the husband and I rather like it. As the sun has started to make a more regular appearance I thought it was time to crack open my favourite summer recipes and this simple recipe is packed full of sunshine flavours. 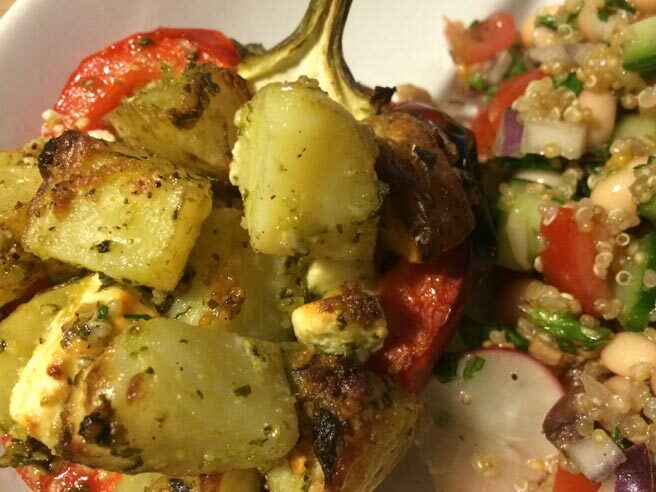 The fresh taste of roasted pepper with the season’s finest new potatoes, salty feta and a smack of zingy fresh pesto is the perfect way to welcome in the summer and if you’re anything like the husband and me, it’ll put a smile on your face too. I make my own pesto as I love the wonderful smell of smashed basil, lemon, pine nuts, garlic and parmesan whizzed together, but you could always use shop bought if you’re short of time or simply can’t be bothered to make your own. Apart from spending a bit of time making pesto the rest of the recipe is quick and easy to throw together. Boil the potatoes. Slice the peppers in half and place on a backing tray. Toss the cooked potatoes in pesto and stuff into the peppers. Top the peppers with feta. Pop in the oven. Cook. Eat. I served my peppers with a rather nice chopped Greek-style salad – delicious. Oooh, that sounds like a nice alternative to new potatoes.